Mrs. Marianna V. Vardinoyannis has been a world advocate and campaigner for human rights and the protection of children’s health and welfare. She is Goodwill Ambassador of UNESCO since 1999 as well as Founder and President of the “Marianna V. Vardinoyannis Foundation”, of the “ELPIDA Association of Friends of Children with cancer” and of the “Orama ELPIDAS” Association. She also serves as member of the Bibliotheca Alexandrina Advisory Board, as Trustee of the MENTOR Foundation against drugs, as member of the Leadership Council of the “Robert F. Kennedy Human Rights” and of “Concordia”, as member of the Board of Directors of the “Nizami Ganjavi International Center” and of “The Hellenic Initiative”, as founding member of the “Light of Africa Foundation”, as President of the Honorary Committee of the Special Olympics Hellas, and many other organizations. She holds BA in History of Art and in Economics, MPhil in Archaeology as well as Honorary Doctorates in Laws, Philosophy and Human Studies. She has dedicated her life to save young lives from cancer and protect their innocence from various threats. She created the first Bone Marrow Transplant Unit in Greece (in 1993) and the first Pediatric Oncology Hospital in Greece (in 2010) which receives the 80% of childhood cancer cases of the country. For more than 30 years, she is fighting against childhood cancer through “ELPIDA Association of Friends of Children with cancer” and helped thousands of children to be saved, including more than 1000 children who got the possibility to receive bone marrow transplants. She also established the Bone Marrow Donor Registry “Orama Elpidas” (in 2014) registering more than 85.000 volunteer bone marrow donors up to 2018. Her vision is the building of a world without borders in health, especially in children’s health and the fight against childhood cancer, where no child will need to travel to other countries for treatment. 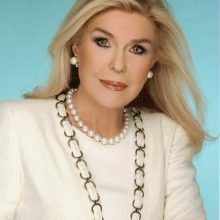 Through the “Marianna V. Vardinoyannis Foundation” she supports children and families, schools, people in need and refugees in Greece as well as UNESCO programs for education and culture, promoting the United Nations Development Goals. She organized many international conferences in Greece and abroad and campaigns for social awareness on crucial issues of our times. She has launched the “Support Schools” projects through which it provides books, clothes, equipment, computers, etc, to schools of Greece in order to help children, parents and teachers, during the financial crisis, as well as the “Support vulnerable social groups” program focusing on poor areas of Athens by providing people-in-need with food and personal hygiene products. In 2016 she launched the “Welcoming Cities for the Refugees” program in co-operation with UNESCO and in 2015 the “WE CARE” program providing medical care to refugee children in Greece. She also launched the “Speak Truth to Power” program in Greece, a program of the “Robert F. Kennedy Human Rights” Center, for the promotion of the human rights education in the Greek Schools. She funded the establishment of the “Chair of the Greek immigrants” and the “Ioannis P. Vardinoyannis” Library at the New York University in the USA, of the “Constantine Karamanlis Chair for the Hellenic and Southeastern European Studies” at the Tufts University, of the “Alexandria Center for Hellenistic Studies” at the Bibliotheca Alexandrina in Egypt, of the “Municipal Indoors Athletics Centre -George and Evangelia Bournaki” in Ermioni, Greece, of the Kindergarten of Agios Nikolaos in the Municipality of Ano Liossia, in Athens, Greece and many others. She achieved many humanitarian initiatives in support of victims of natural disasters such as the revival of Makistos village that was destroyed by fire in 2007 by rebuilding 70 houses, the renovation of the Kindgarten of Mandra in Athens which was destroyed by floods in 2017 and this year she undertook the rebuilding of Lyreion Orphanage which was destroyed by vast fires in Mati Attikis in 2018. She has granted the rank of the Officer of the Legion d’ Honneur of the French Republic (2015), the rank of the Chevalier of the Legion d’ Honneur of the French Republic (2006), the “Mother Teresa Medal” of the Albanian Republic (2015), the “Golden Cross of the Order of Benefaction” of the Hellenic Republic (2002), the Office of the Great Lady of the Patriarchal Throne of St. Mark (Patriarchate of Alexandria, 2008) and she has received many distinctions such as the Athens Academy Award (1997) and the Academy of Athens Golden Medal (2017), the Ripple of Hope Award of the “Robert F. Kennedy Human Rights” (2015), the Grand Prix de la Charte de Paris contre le cancer-AVEC (2014), and many others.